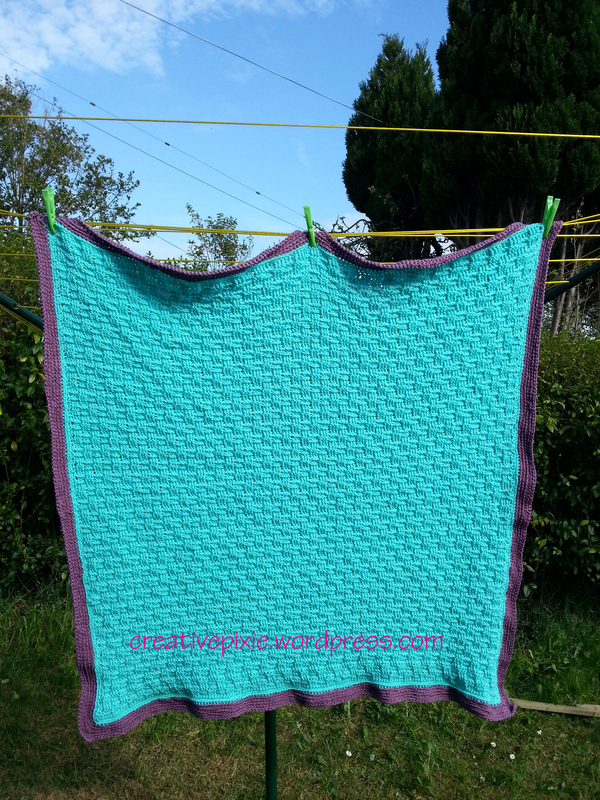 I’ve been waiting to do this post for a few weeks now as it’s a baby blanket for my friend Maria and as most of us know babies have their own timetable for arriving. My inspiration for this blanket was a pattern I found online here. I’d always wanted to try basket weave crochet so thought this would be ideal. As I didn’t know if the baby was to be a boy or a girl I thought that I should pick colours that could do both. I chose some Stylecraft Special yarn in Aspen for the main colour and Grape for the border. 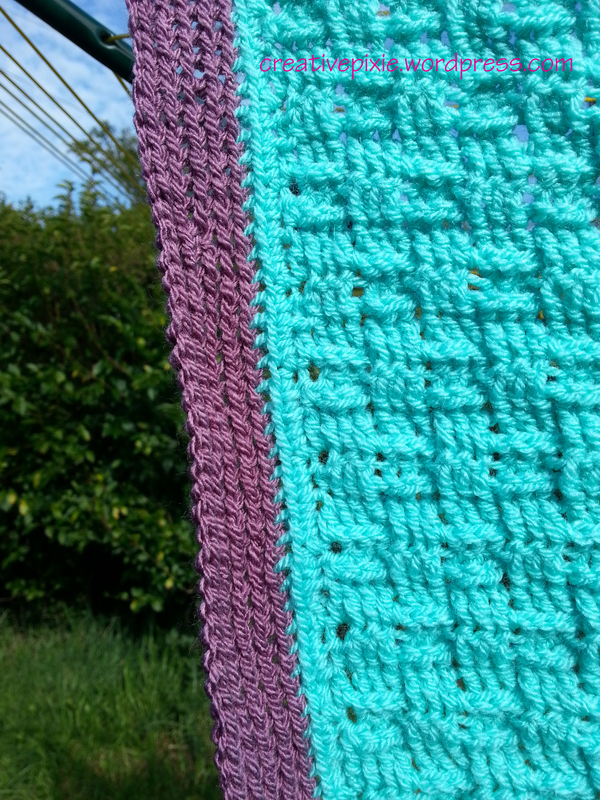 This was the first pattern that I’d ever done that required FPdc and BPdc (front post double crochet and back post double crochet in US terms) though unfortunately I’d misinterpreted what a post was. This resulted in my style of basket weave and after doing 20 rows I was not going to start again. I thought it looked ok so just carried on. I also made a few changes to the border and the finished size of the blanket so if you follow the pattern for yourself it will look different from my one. After a month of mad crocheting to get the blanket finished by the Maria’s due date I got the blanket finished and had it ready and waiting. Ten days later, after an induction and emergency c-section little Daniel arrived – all 10lbs 10 oz of him! So now Daniel is here and his blanket has been gifted to him I can now show you the finished item. I couldn’t believe how big the blanket was when I hung it up. 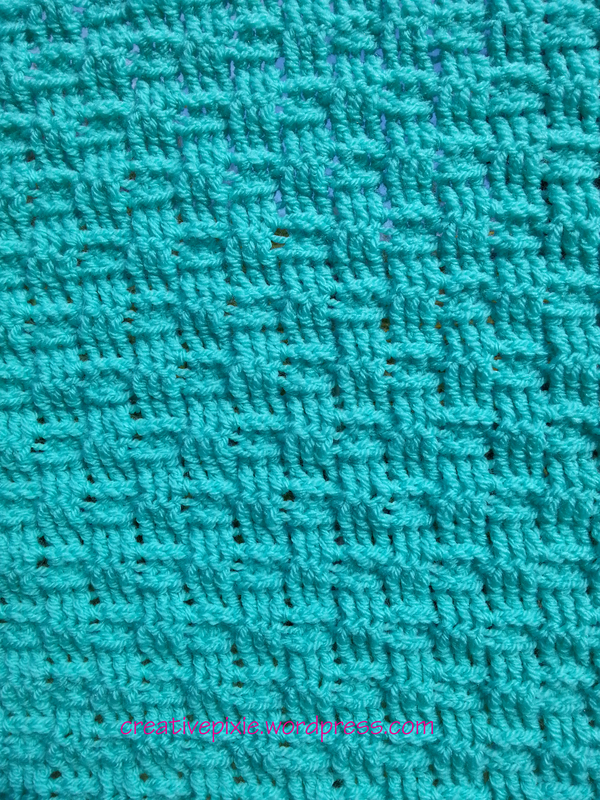 I’m quite proud of the finished weave, though not a traditional basket weave, I think it looks very neat and tidy. The border in the grape – yummy. If I have learnt anything from this project it’s to read up on the technique of new stitches before I try them. Has anyone else out there had a similar happy accident with a project? Ah, so you are the one who has bought all the Grape 😉 Can’t get any just now! Nice blanket, different from all the usual blankets you see. Thanks. I saw that the grape had sold out on Deramores, I wonder what everyone has bought it all for? The blanket is gorgeous! Daniel is one big baby, hope mother and baby are doing well. I have yet to try a basket weave, maybe one day. I always make my baby blankets large so they can use them for several years. 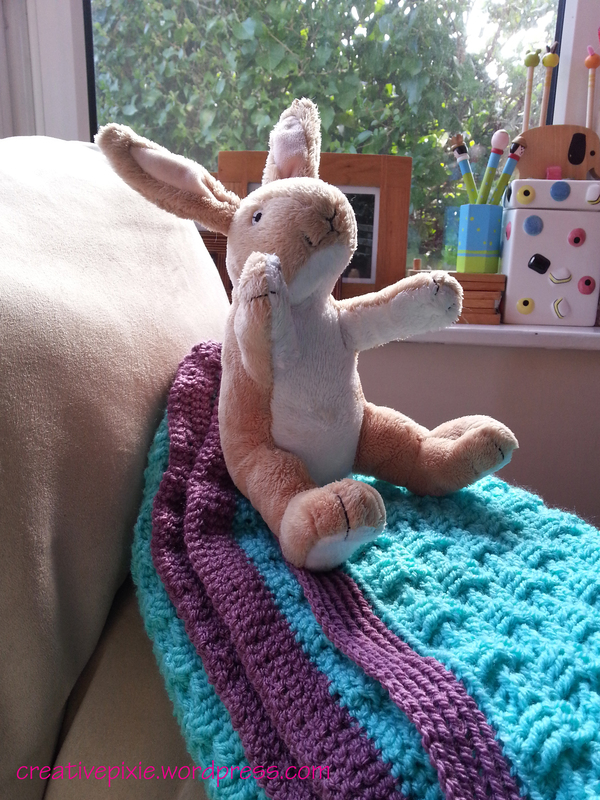 I had planned on doing a pram sized blanket but this turned out bigger… Could probably do a cot bed. It looks wonderful, even if you didn’t follow the directions exactly as written. Beautiful blanket! It is gorgeous. I don’t think that it matters that the stitch is your own version – surely that is being creative and how a lot of things got ‘discovered’ in the first place! That’s a good way of putting it. Thanks for your comments. What a gorgeous blanket something Daniel can keep forever ! I love your blanket! The color is stunning!! Thank you. When I first saw the aspen colour I knew that would be perfect. 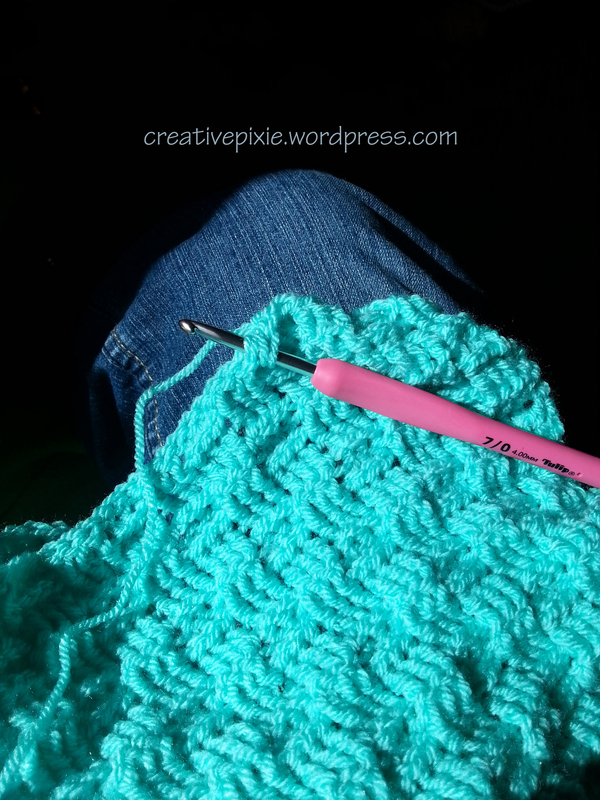 I really need to get better at reading crochet Patterns so I think I’ll look out for another unusual pattern. It looks great. I absolutely love the colours! I love the fact that it isn’t white or cream and those colours are just delightful and fun. Lovely blanket. Thanks, I think the colours are rather zingy! 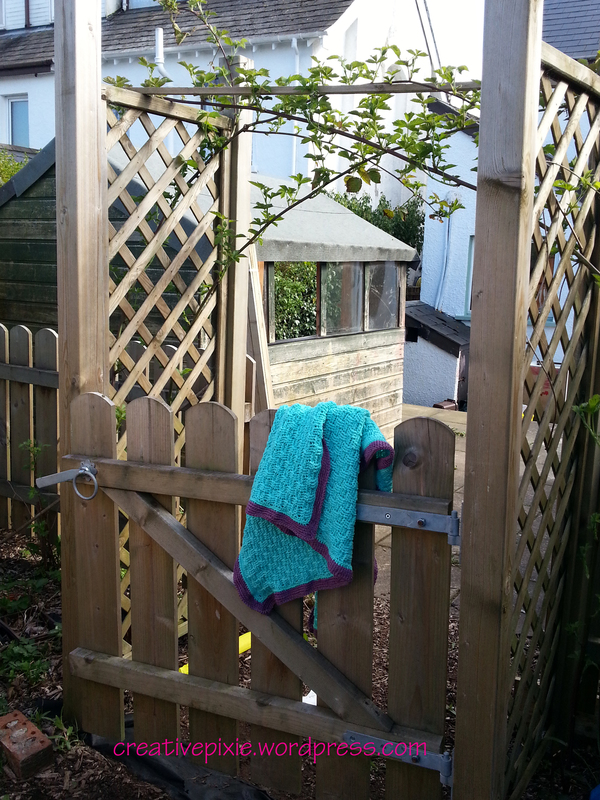 I love it – and being slightly bigger means that baby Daniel can use it for a very long time! My kids are all school age now, but their cot quilts – made a bit bigger than the usual by their grandmother, are still used for snuggling on the couch. I can see this blanket getting the same treatment! Awww, thanks for your comment . This is absolutely beautiful…the colours, pattern..all gorgeous. 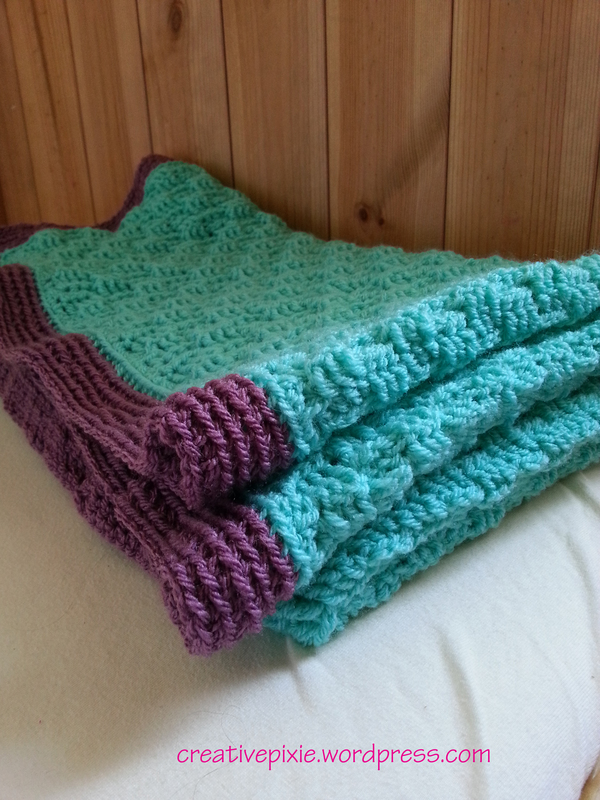 The blanket is gorgeous, your basket weave looks really good and I love the colours. It is probably not a bad thing that you made it bigger as Daniel has made quite an arrival at 10,10! Hope his Mama is doing ok? anyone have a revised pattern to make this the size of a car seat blanket for a toddler with slits for car seat belt and buckle?